Yelp is a fundamentally flawed review service being kept afloat by investors desperately figuring out a way to make the platform profitable. Overrun with spammed content its filtering attempts have turned things from bad to worse, alienating businesses and users alike, while it is bogged down in extortion scandals and court battles. There is no doubt that right now Yelp can help bring in the business, or get rid of it, but I always question spending time and resource invested in a platform that may not be around for the long term. And there are plenty of reasons why Yelp may be another internet also-ran. The way Yelp is set up it allows for fake, misleading, inconsistent and inaccurate reviews to be posted. Yelp’s attempts to control the fake reviews have made matters worse. Yelp’ maintains that misleading, inconsistent and inaccurate reviews are ‘freedom of speech’ but they have lead to the creation of an unreliable platform when it comes to choosing who should get your custom. The thousands of businesses that have accused Yelp itself of extortion is now too large to ignore. Despite burning through over $200 million in the last decade Yelp still makes a loss. Yelp is starting to loose ground, in the courts and in public (causing shares to drop nearly 50% in recent weeks) which may well cause it to collapse. Yelp has struggled with this since the beginning but it is reaching such an unmanageable situation that the business is struggling to maintain control. Yelp allows anyone to leave a review for any place without proving they are a real person or that they have ever been to that place. Anyone with a grudge to, anonymously, criticise a business. Businesses to leave negative reviews about their competitors. Businesses to leave positive reviews about themselves. 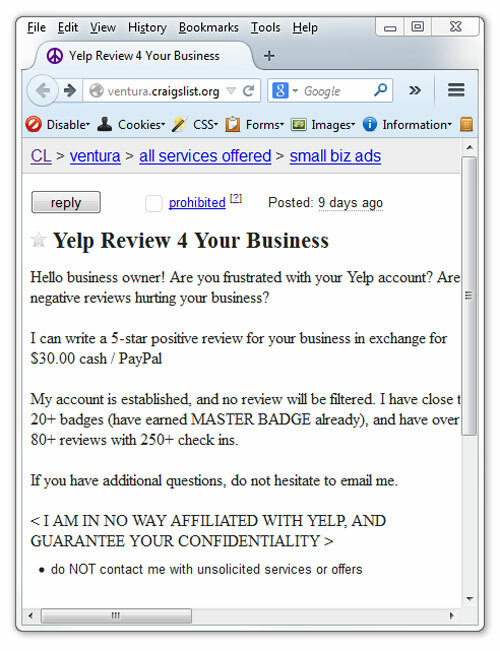 Yelp reviewers to try and blackmail businesses in return for positive Yelp reviews. Yelp reviewers to rent/sell their profiles to the highest bidder. Harvard Professor Michael Luca found fake reviews had reached 20% of all reviews in 2013 (up from 5% in 2006) and Yelp itself thought this level had reached 25% by late 2013. Yelp claims that it has filters in place to stop fake reviews getting onto their service but as I’ll explain in a moment these filters have just turned a messy system into mayhem. reviewers can claim to be someone they aren’t or work for someone they don’t which Yelp calls “personal opinion”. reviewers can end up giving reviews to the wrong company as happened with batteryguy.com of Georgia (US) when someone criticized a product that they don’t stock but probably ordered elsewhere. Again Yelp classed that “personal opinion”. The chef and food writer Andrew Zimmern has called Yelp a “forum for a bunch of uninformed morons” while even Yelp reviewers themselves question the quality of their peers. There is no guidance, even from Yelp, as to what the star system actually means. What to one person is a two star will be a four star to others. This means even those who give broadly similar feedback in the text can end up providing different star ratings which in turn affect the overall score of any business. Josh Ozersky of Time Magasine found that “the reviews are, at best, wildly uneven“. Kat F. visited a Laurelhurst Market steakhouse in Portland and gave it two stars because it was only for meat lovers … which is generally who steakhouses are for! Vegan B. gives Ottobar in Baltimore two stars because it is “alright” but unfortunately it is located in Baltimore.. which s/he hates! M&Mﾒs World in London got two stars for refusing to break the law! Grahamwich in Chicago got a one star review before it had even opened. This one has been pulled by the author after being made into a video but it was one star for Stratford Diner Inc in Stratford (NJ) because the manager didn’t want to chat on the ‘phone! Yelp itself was victim to this when it became associated with the American Legislative Exchange Council (ALEC). Their own profile received over 2,500 one star reviews for this action even though it has nothing to do with their core business which is providing reviews. Yelp’s position of allowing reviewers to say whatever they want to say, as long as it is not libelous, means that it has backed itself into a corner. On one hand a large portion of the service continues to fill up with garbage but on the other hand if it interferes it would itself be seen as censoring the very freedom of speech which it uses to defend itself when businesses demand to know who these anonymous users are that are criticising their organisations. But the more users see reviews that, for example, read “[the manager is] someone who thinks her poop doesn’t stink …” the more it undermines the confidence of the general public whose visits it needs to justify its existence. A recent study by Nielsen found 47% of internet users don’t trust Yelp reviews (compared to 41% for Zagat and 51% for Google+). The same data revealed that only 9% of users had left reviews on Yelp “at least a few times” which underlines how small a cross section of society Yelp reviewers actually are. Interestingly, and worryingly for Yelp (and other review sites), it found less trust among younger users which could add one further reason why the service will be undermined as more savvy surfers become a greater portion of internet users. a computer controlled algorithm to filter out what it believes are fake reviews. sting operations on companies that provide fake reviews. ‘consumer alerts’ on listings where it suspects the owner is creating fake reviews. Have a full profile including an image (not necessarily a picture of you, just an image). Don’t leave reviews which are all very positive, all very negative or a mix of the two. Include some three stars along the way. Access the internet from a location near the venue you are reviewing. First timers to Yelp are motivated to visit by a very strong feeling, positive or negative. Their objective is to leave feedback and so they often skip the full profile setup but find later their review has been filtered. Alienated by the system they leave, never to return. Just Google “why doesn’t my review show up on yelp” to find endless reviewers scratching their heads! On the same note this initial motivation means their first review is often a one star or a five star but because Yelp views these as suspicious when placed by first time visitors there is another reason to filter them, even if the user does set up a profile. A traveler waiting for his baggage at Heathrow Airport in London (UK) may decide to write a quick review of a place he was at in New York the night before … chances are that genuine review will be filtered as suspicious just because he is in the wrong place. Genuine spammers use proxy servers to access the internet from a variety of locations around the world. They can look as if they are logging onto the internet in New York even if they are based in Delhi so the filter misses the professional spammers. In other words Yelp’s review algorithm can very often filter the genuine and let through the fakes. At the same time it alienates new users leaving the reviews that show in the hands of a relatively small number of ‘regulars’. Yelp places a huge amount of publicity behind these but it took a year long investigation in New York to uncover just 19 companies that were producing fake reviews on demand for businesses. It’s the tip of the iceberg but there simply isn’t the resource available to find the whole iceberg. So what Yelp lacks in resource it makes up for in PR hype but individuals and companies offering to write positive reviews for establishments litter the web. Just try services like fiverr, Craigslist and Black Hat World. 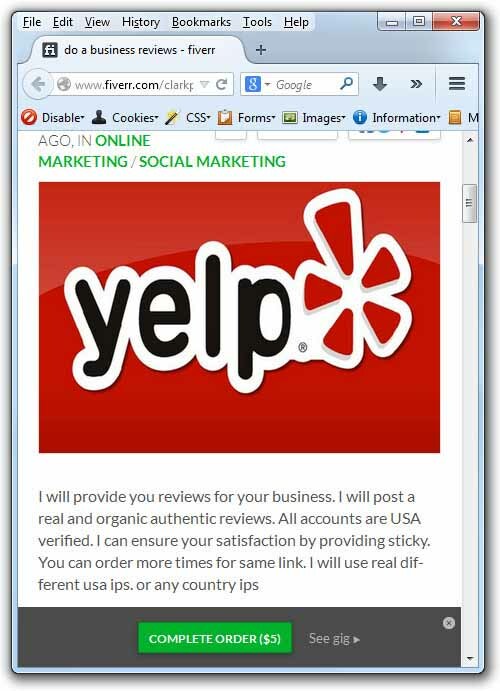 Yelp has taken to showing alerts on the profile pages of some businesses it suspects of creating their own reviews. This will either be a “A number of positive reviews for this business originated from the same IP address” or “We caught someone red-handed trying to buy reviews for this business” but both can’t be trusted. Yelp mostly lists eating and entertainment venues and many of these offer free WiFi services. Customers on the move might want to write a 5 star review while they’re sipping outstanding coffee and log on to the free WiFi service to do so but what they end up doing is setting off a ‘consumer alert’ and making the business they want to recommend look like a shifty operation. On the flip side it encourages underhand businesses to use the alert against their competitors by sending people into venues in order to post 5 star reviews while linked to the WiFi service. Not only does this alert hit genuine situations, it provides a gateway for businesses to ‘hit’ each other. This stems from the limited sting operations they run but again it opens the door to competitors who can pose as another company in order to buy positive reviews and ultimately bring down someone else. Yelp is also not clear on what ‘buying a review’ actually means and has started hitting out without warning. L.A. Epic Club Crawls in Hollywood offered discounts on future visits if customers left a review on Yelp which lead to their profile page having a ‘suspicous warning’ placed on it. While on the flip side they have no issues themselves with accepting free venues for their own meetings. While that’s hypocritical it’s not really the issue – the issue is that Yelp’s filters are making some genuine companies look shifty while the truly shifty ones lie untouched. Would you want your clients to get mixed up in that mess? When East Bay Express wrote their now infamous piece Yelp and the Business of Extortion. back in 2009 it raised some eyebrows … a little. You have a profile page on Yelp with some positive reviews. A Yelp sales rep calls you to try and sell advertising which you turn down. Your positive reviews start getting moved to the ‘filtered’ area and/or negative reviews start popping up. Five years down the line and that East Bay Express article is still receiving comments from business owners confirming they have been at the sharp end of this practice. A reddit thread entitled yelp.com extorting small businesses had over 1,500 responses from individuals recounting similar stories over and over again. In fact wherever you go on the web (try Googling “can I trust Yelp reviews”) this response from thousands of businesses is repeated which makes Yelp’s denials seem to ring hollower with each day that passes. Like many internet start ups Yelp lost money but most big names have found a way to move into the black. Yelp hasn’t and its alleged aggressive sales tactics have grown the number of business it alienates to higher and higher levels. It’s faulty attempts to block fake reviews has also seen it alienate an ever greater number of reviewers. No other start up of this scale has ever caused so much anger in what should be its revenue generating client base. Angel Investor Peter Shankman says he’ll donate $5,000 to charity if Yelp is still around in September 2015 with the same business model. He believes users will turn to trusted sources like Google+ where they can see what their peer group thinks, rather than what strangers say. And strangers are what they are. Now I know that Yelp Reviewer Yee Gan ﾓYogi Bearﾔ O. is really Yee Gan Ong who likes peanut butter M&Ms, has few friends in the real world and spends most of his out of work hours trailing around London writing Yelp reviews I don’t want to base any of my decisions on his thoughts. But I only know that because he came out from behind the curtain in this Telegraph article. Most don’t so we have no idea of their tastes and value sets. Shankman may be right about Yelp’s survival but there are other reasons why it won’t make the long run. With over 2,000 complaints against Yelp now filed with the FTC since 2008 and Yelp admitting it receives, on average, six subpoenas a month things are reaching a head. And it would seem the tide may also be changing in the courts. The Court of Appeals of Virginia has recently ruled that Yelp must reveal the identities of 7 reviewers after Joe Hadeed’s long fought legal battle to reveal the identities of Yelpers he says faked reviews of his carpet cleaning business. While Yelp believes we should be able to criticize anonymously the service has now reached a level where comments can affect the success, or failure, of a business and so questions regarding freedom of speech are starting to bubble. Should we really be able to say whatever we want, without proof, when it can affect someone’s livelihood? Probably not for much longer. Joe Hadeed (above) claims to have laid off 80 staff since 7 one star reviews were posted on Yelp. That’s 80 people out of work because seven people, or potentially one person with 7 Yelp accounts, or possibly even Yelp itself, posted negative reviews without needing to show that they had ever used Joe’s business. Is it alright to just shrug shoulders and say “at least we have freedom of speech” when it can have such a big impact on people’s lives? If the courts finally rip open the lid off Yelp and expose many of its members to litigation the service will collapse overnight and their is an increasing body who believe this day is not far off. That has been seen by a near 50% collapse in Yelp share prices over the last few weeks and recommendations to pull funds out of the company. I don’t want to put them on the radar of Yelp’s sales staff with their endless and aggressive calls. I don’t want them to be promoted on a service full of fake, misleading, inaccurate and inconsistent reviews. I don’t want them to waste time and money on a service which everyday users themselves are increasingly realising holds limited value. I don’t want to spend time pushing Yelp pages out of Google’s top 10 after one of Yelp’s alleged extortion attempts. I don’t want them to waste time and money on a service which looks like it will join the dodo. I advise my clients to put their efforts into platforms which offer greater transparency and help users figure out if feedback is coming from their peer group rather than a stranger who hides behind a curtain. Yelp may not be around for much longer but there is one blight on the horizon I share with Chicagomag’s Jeff Ruby, Yelp may pass away but another similarly flawed platform will fill its place. Ever the optimist I hope that the courts, in their final rulings, will provide protection that will stop something like Yelp ever rising up again. In the meantime, good luck Joe Hadeed.